Enjoy the voices of Appalachia through hearing stories and attending workshops that will enable them to develop a cultural intelligence through the arts of listening and speaking. FEATURED TELLER BOBBY NORFOLK WILL PRESENT A FREE WORKSHOP FOR AREA TEACHERS ON HOW TO USE STORYTELLING TO ENGAGE EVEN THE MOST APATHETIC LEARNERS. Adam Booth - His storytelling blends traditional folklore, music, and an awareness of contemporary Appalachia. His original voice, both humorous and touching, is influenced by generations of diverse storytellers from West Virginia. 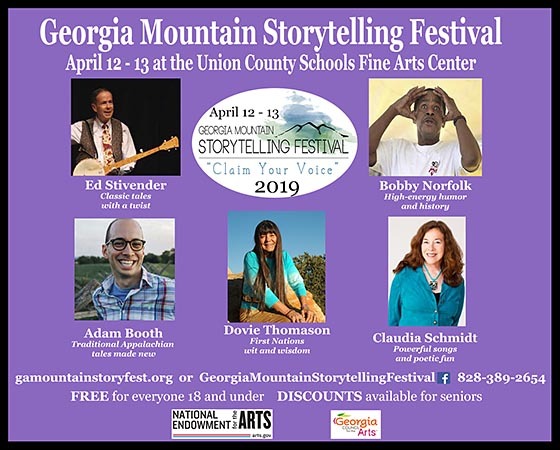 Bobby Norfolk - His innate ability to read and connect with audiences of all ages makes him one of America's premier storytellers. Using dynamic movement and vocal effects, he creates vibrant characters who come to life through imaginative, creative story. Living History programs that highlight the African-American experience, and toe-tapping musical shows that feature song and live musicians are also part of his repertoire. His stories promote character education traits (such as respect and responsibility), cultural diversity, and literacy. He inspires and motivates kids and adults telling stories that can be shared through the oral tradition. "No fancy electronics, just teller, listener, and the imagination." Claudia Schmidt - More than 4 decades as a touring professional have found Michigan native Claudia Schmidt traversing North America as well as Europe in venues ranging from intimate clubs to 4,000 seat theaters, and festival stages in front of 25,000 rapt listeners. She has recorded nineteen albums of mostly original songs, exploring folk, blues, and jazz idioms featuring her acclaimed 12-string guitar and mountain dulcimer playing. Ed Stivender - In reviews of his work, Ed Stivender has been called "the Robin Williams of storytelling" by the Miami Herald and "a Catholic Garrison Keillor" by Kirkus Review. Since 1977, when he left his day job as a high school teacher in Connecticut and turned to storytelling full-time, Ed has fabulated his way around the globe-appearing in schools, churches, coffeehouses and theaters, as well as at major storytelling festivals. Dovie Thomason - The wise, boisterous teaching tales of her Lakota and Plains Apache relatives come alive in listeners' imaginations as Dovie Thomason shares her culture with understanding, sly humor, and astonishing vocal transformations. Told with elegance, wit, and passion, her stories inspire delight in the spoken word and teach respect for values passed on through generations. When Dovie tells stories from her own life and from her people's experience, the result is a contemporary vision of the rich cultures of the First Nations of North America.